Although most safari operators will do their best to minimize your time in Nairobi, you may well find yourself with a day to kill in Kenya's capital city. Like many African cities, Nairobi has a reputation for congested roads and high crime rates. While it's true that some areas are best avoided, most of the top tourist attractions are located in the city's safest areas. Keeping safe in Kenya is really just a matter of common sense, and a visit to Nairobi can be hugely rewarding. Traffic is often intense. Hiring a car and a driver with an intimate knowledge of the city's least congested routes is definitely the easiest way to get around. If you only have a day in Nairobi, it's best to focus your attention on one area of the city. This itinerary is based mostly in the suburb of Karen and its immediate surrounds. In this way, you can spend more time exploring and less time avoiding matatus (local taxis) on the roads. Karen is also home to some of Nairobi's best hotels. For a truly special city stay, check out the Nairobi Tented Camp — a luxurious and utterly unique accommodation option located in the heart of Nairobi National Park. Here, you can experience Kenya's natural wonders without leaving the bustling capital. Stick your head out of the sunroof, breathe in the fresh air and listen to the incredible birds that call Nairobi National Park home. 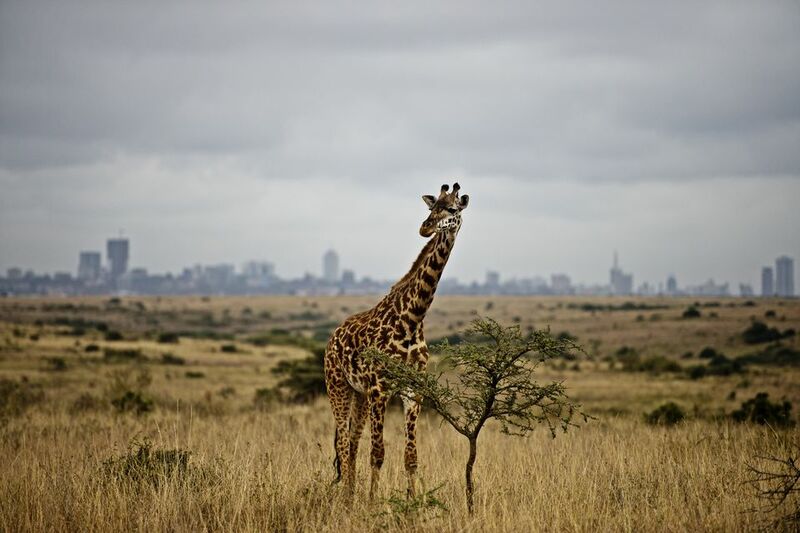 Nairobi is the only city in the world that is gazed upon by wild zebras, lions, and rhinos. Nairobi National Park was established in 1946 long before the city burst its seams. Located just four miles/ seven kilometers from the city center, it is home to the endangered black rhino, all of the big cats and a myriad different antelope and ungulate species. It is also a good spot for birding, with more than 400 avian species recorded within its boundaries. The park plays a vital role in education, as its proximity to the city makes it easy for school groups to visit and interact with Africa's wildlife. Game drives and bush walks are on offer for visitors. After your game drive, make your way to the David Sheldrick Wildlife Trust Elephant Orphanage, also located within the park. Dame Daphne Sheldrick has been raising elephant orphans since the 1950s when she lived and worked in Tsavo National Park. She established an elephant and rhino orphanage in the Nairobi National Park in the late 1970s, as part of the David Sheldrick Wildlife Trust. Dame Daphne established the Trust in honor of her late husband David, the founding warden of the Tsavo National Park and a pioneer conservationist in Kenya. The orphanage is open to visitors for one hour every day (11:00 am to Noon). At this time, you can watch the babies being bathed and fed. After your time with the orphan elephants, head to eco-friendly Marula Studios. This artists' co-operative is the perfect place to look for unique souvenirs, many of which are made at the onsite workshop from recycled flip-flops. You can take a tour of the flip-flop recycling process, purchase a pair of Maasai sandals, or enjoy a good cup of Kenyan coffee in the next-door café. If you loved the book Out of Africa by Danish author Karen Blixen (or the iconic movie adaptation starring Robert Redford and Meryl Streep), a trip to the Karen Blixen Museum is a must. The museum is housed in the original farmhouse that Blixen lived in from 1914 to 1931. It is the farm referenced in the film's haunting opening line: "I had a farm in Africa, at the foot of the Ngong Hills." Today, the museum contains information and artifacts about her life, some of which pertain to her famous romance with big game hunter Denys Finch Hatton. After touring the museum, sit down to lunch at the nearby Karen Blixen Coffee Garden. Spend the rest of the afternoon at The Giraffe Centre, located in the neighboring suburb of Lang'ata. This top Nairobi attraction was established in the 1970s by Jock Leslie-Melville, who turned his home into a breeding center for the endangered Rothschild's giraffe. The program has enjoyed huge success, and many breeding giraffe pairs have been released back into Kenya's game parks and reserves. The center also educates local school children about conservation and has done important work to raise awareness about conservation issues. The center is open daily for tours and visits from 9:00 am - 5:00 pm, and has an elevated walkway for hand-feeding the giraffes. Consistently rated as one of Nairobi's best restaurants, dinner at The Talisman brings your day in the city to the perfect close. The decor is sumptuous and the food superb, reflecting an interesting fusion of African, European, and Pan-Asian cuisines. The bar has one of the best wine selections in the capital, and you can even toast your time in Nairobi with Champagne by the glass. On Saturday, live music adds to the atmosphere. Advance reservations are highly recommended. This article was edited by Jessica Macdonald.